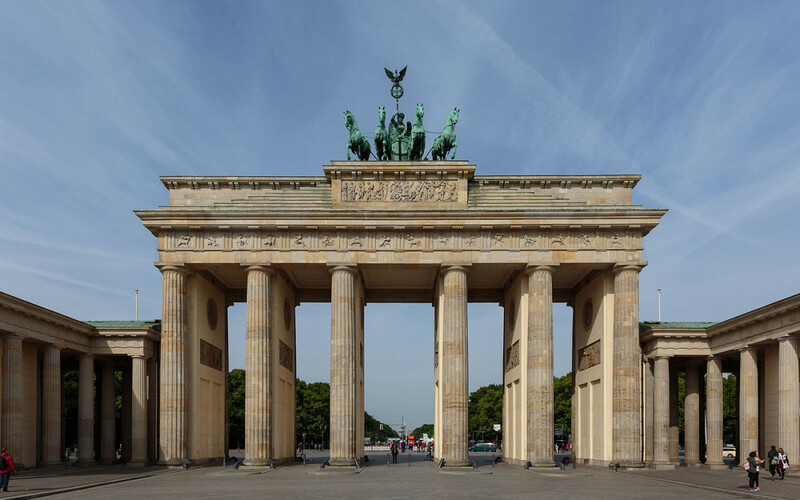 We close our monumental tour of Berlin with the Brandenburg Gate, an archetypal example of how the symbolism of monuments evolves. The Gate was commissioned by King Frederick William II of Prussia and, when completed in 1791, was named the Peace Gate (German: Friedenstor.) The goddess riding the Quadriga, a chariot drawn by four horses, was Eirene, the goddess of peace. After the 1806 Prussian defeat at the Battle of Jena-Auerstedt, Napoleon took the Quadriga to Paris. When Napoleon was defeated, in 1814, the Quadriga was restored to Berlin and redesigned for a new role as a Prussian triumphal arch; the goddess, re-purposed as Victory, was equipped with the Prussian eagle and Iron Cross on her lance with a wreath of oak leaves. When the Nazis ascended to power, they used the gate as a fascist party symbol. After the Berlin Wall was built, in 1961, West Berliners used the Gate as a rallying point. Under the pretext that Western demonstrations required it, the East closed the checkpoint at the Brandenburg Gate on both sides, a situation that was to last until 22 December 1989. When the Wall fell, the gate came to symbolize freedom and the desire to unify the city of Berlin.